OpenSpace proposals are welcome till the end of the conference. WikiSym 2008 is realized in cooperation with ACM SIGWEB. Accepted submissions will be provided as part of the conference proceedings. 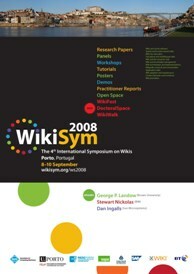 The proceedings will be published in the ACM Digital Library and can be referenced as papers that appeared in the "Proceedings of the 2008 International Symposium on Wikis (WikiSym 2008)". OpenSpace is the energy of a good coffee break, with the flexible structure of wiki, where last minute, new creative ideas that otherwise wouldn't be on the WikiSym program to be worked on by all types of wiki enthusiasts, in a format that allows deeper consideration of an issue than can be achieved with a 20 minute presentation (more details). WikiFest is a conference session devoted to helping you start and grow a successful wiki (more details). 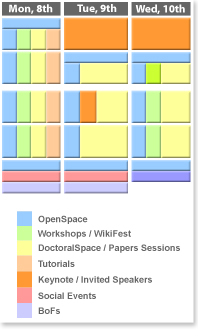 WikiWalk will be an experimental session that will take OpenSpace out into the quarters of Porto city (more details). Poster presentations enable researchers to present late-breaking results, significant work in progress, or work that is best communicated in conversation. WikiSym's lively poster sessions let conference attendees exchange ideas one-on-one with authors, and let authors discuss their work in detail with those attendees most deeply interested in the topic. the goals -- What contributions will your research generate? the approach -- What is being performed to achieve the goals? How will results be validated? Submitted papers should use the ACM SIG Proceedings Format. Please submit your papers or proposals in PDF format, through our Submissions/Cyberchair submission system. Questions regarding research papers and practitioner reports may be directed to papers@wikisym.org. Other kinds of submissions and inquiries should be sent by email to the respective email addresses, as below described. Other questions can be sent to chair@wikisym.org. More information about the Porto can be found here. The text of this Call for Papers is available at the Promote page both in PDF and ASCII formats. This page was last modified 13:58, 27 August 2008.